A recent article on CNBC concerning the February 8 military parade in Pyongyang describes what appears to be a “key vulnerability” in North Korea’s intercontinental ballistic missile (ICBM) force. While the article provides a reasonable overview of the subject it does, however, mischaracterize a number of critical points, leaving readers with an inaccurate understanding of the issue. Before addressing a few of these points it is important to understand some underlying characteristics of North Korean military parades. First and foremost, North Korea uses these parades to display only the weapons systems that it wants the public to see. It does not display all its weapons systems every time, or for that matter, all its latest weapons systems. 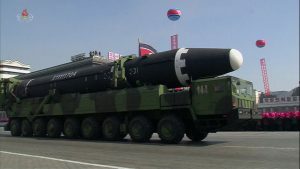 For example, the Hwasong-11 (KN-02) short-range ballistic missile (based upon the Russian SS-21 that became operational in the mid-1970s) had been in service for a number of years before it was first displayed in the 2007 military parade. The purpose of these parades is to convey a specific message to the world—that North Korea is a powerful and prosperous nation. This brings us to the second point. North Korea has long implemented camouflage, concealment and deception (known as CCD) procedures for all major military operations and parades. What is often seen is intended to mislead or misdirect the world as to its true capabilities and intentions. Finally, there is a host of ballistic missile related equipment that has never been displayed at parades that is just as critical to assessing North Korean ballistic missile capabilities as are the launchers themselves. Without understanding and considering these factors, making an assessment of any “key vulnerability” in North Korea’s Strategic Force’s (the organization that operates the nation’s ballistic missiles) capabilities is extremely challenging at best. To help better understand what we learned (or didn’t learn) from North Korea’s Army Day parade, we would like to address a few points that have been asserted. While this is undoubtedly true for the massive Chinese purpose-built WS-51200 wheeled transporter-erector-launchers (TEL) it is not true for towed mobile-erector-launchers (MEL) and transporter-erectors (TE). North Korea possesses all the capabilities to produce towed MELs and TEs that it requires. Additionally, it possesses sufficient numbers of cabs capable of towing these launchers should it wish to dedicate them to its ballistic missile force. North Korea has been converting imported heavy vehicles from a number of countries into MEL/TE/TELs since the late-1980s. Not everything that has been done, however, has been displayed during parades. During the past three years, the North has started to produce medium-sized tracked TELs based upon an existing tank chassis it manufactures for the Pukkuksong-2 (KN-15) medium-range ballistic missile and Kumsong-3 (KN-19) coastal defense missile. More recently it has modified the imported Chinese WS-51200 chassis by inserting an additional axle into the TEL used for the Hwasong-15. This was made possible by the chassis’ modular format that facilitates such modifications. While it undoubtedly aspires to produce a WS-51200 class TEL and wants the world to believe it can (that’s why they release imagery of their so-called TEL factories) North Korea’s industrial infrastructure is not presently capable of doing so using indigenous resources. It is not the size of the ballistic missile launcher—ICBM or otherwise—that is the real issue here. It is the increasing number of launchers and their ability to move around the country, combined with the actual number of ICBMs produced, that presents both the challenge and the threat. All nations with ballistic missiles do not simply keep producing launchers just because they can. They produce them to meet requirements that are based upon threat assessments, vulnerability assessments, force structure requirements/capabilities and other considerations. North Korea is no different. It almost assuredly has produced a requirement for the number of missiles (in inventory or scheduled to be manufactured), number of TELs and other associated equipment required by the Strategic Force based upon such assessments. It would be unwise to believe that they have not already achieved that requirement at a minimal level or that there is any “key vulnerability” with regards to the number of launchers currently in inventory. It would therefore appear to be imprudent to simply infer that there is a “key vulnerability” in North Korea’s ability to launch ICBMs based solely upon what was seen during the recent Army Day military parade. The KN-19 name and designation are tentative.